While in Atlanta, my sisters and I went to West Egg Cafe to sample their cupcakes which I heard were really good. The cupcake on the left is a Red Velvet cupcake with a Valentine's Day candy in the middle. 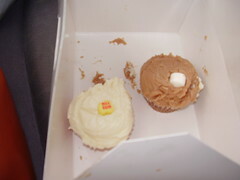 The brown cupcake on the right is their signature "Coca-Cola" cupcake. It was frosting-licking good, and it actually tasted like Coke, especially the marshmallow.